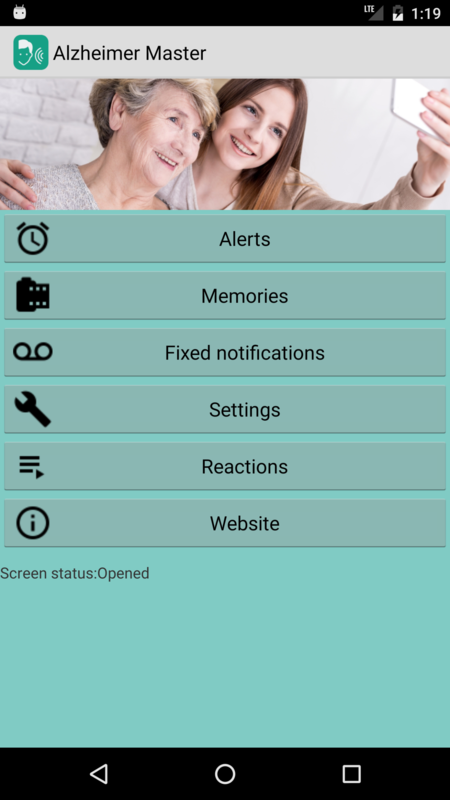 Alzheimer Master is an mobile application, which helps you to coordinate the life of your beloved family member. We had the chance to observe this disease for more generations and we do know how it feels like to be unable to help them during this long-lasting weakening process. This terrible disease causes memory loss, which is in the early stages just uncertainty in life management, but in its final stage the disease results in a full isolation even from their own personal memories. It is an important fact that people diagnosed with Alzheimer disease can recall the voice of their relatives the best. Thus, we designed the application that at time of a notification – instead of a computer-generated sound – the voice of the relatives will be played. The caregiver or the user can set his or her own recorder voice as notification. The mood of the elderly person may be significantly improved, if we play or show familiar music, pictures or videos, to which he or she can still remember. In this function such contents can be set on a daily/weekly basis. After each notification and memories, the application will automatically record the voice and reaction of the elderly person. Through this function the caregiver can check how the patient reacted to the given notification or memory. The application senses when the patient awakes. In many cases when the patient wakes up during the night, he or she does not know about his/her whereabouts. The application can illuminate the room and can also play a prerecorded voice message. Supplementary Android Wear smart-watch is required! This feature is under development! Once the elderly person opens the entrance door of his or her flat, the application plays a message to remind the patient to take the phone with him- or herself. This way, the caregiver will be able to track the location of the patient. As a result of the rapidly growing and ageing society, every second elderly person is or going to be affected with this disease. The disease course is divided into four different stages, starting with annoying forgetfulness and ending with mornings when your elderly relative will not be able to recognize even his or her own bedroom, family members or close friends. By using this application, you can support your elderly relative through different ways. The free version of the application contains functions for reminding the elderly person to take the necessary medication or bringing up kind memories through photos from his or her past. In the for-pay version of the application the caregiver receives a notification once the elderly person leaves his or her home. Also, during the nights, when the person struggling alone, application plays a comforting and informative voice message about the whereabouts the elderly person and switches on the light in order to assist the orientation. After each notification and memories, the application will automatically record the voice and reaction of the elderly person. Through this function the caregiver can monitor how the patient reacted to the given notification or memory. All of the photos and voice messages can be recorded individually by the supporting members of the family, which means security and comfort to the elderly person. During the development of this application we took into consideration that in the future we, caregivers might also need this kind of assistance. Therefore, the application can also be used for own purposes to assist in the management of the forgetfulness at the earliest stages of the Alzheimer disease. The for-pay functions of the application (home-leaving and awakening notification) may only used by specific supplementary instruments (door sensor and Android smart watch), about which you can find a more detailed information on our webpage. If you have additional experience, please share it with us so it will support the development of the application which can make the life of the elderly persons and their relatives simpler and more comforting. Free version: one notification and one memory can be set by the user. In this version the user can test the operation of the application. after the notification. The full version will stay on. Full version: unlimited number of notifications, memories, the awakening function is also available for the users.